between routers R1 and R6. Which of the following is TRUE? Router R3 swaps both the RSVP-TE LSP label and LDP transport label received with new labels. Router R3 uses the same LDP transport label as the one received from router R2. Router R3 swaps the VPN service label received with a new label. Router R3 uses the same RSVP-TE LSP label as the one received from router R2. update be sent on this link? When the reserved bandwidth goes above 80M. When an additional 40M bandwidth is reserved. When the reserved bandwidth goes above 40M. When an additional 80M bandwidth is reserved. 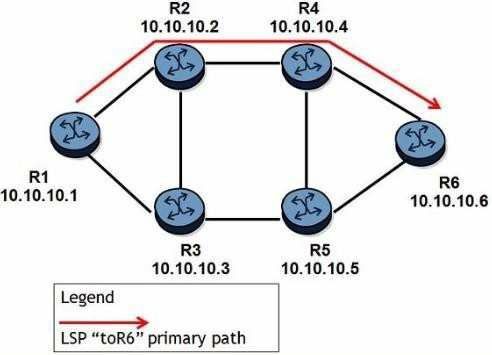 Which of the following CANNOT be used to ensure the LSP toR6" will follow the path R1-R2- R4-R6? the two LSPs have been signaled as shown, two additional LSPs are configured. LSP-3 is signaled first with 50Mbps reserved. LSP-4 is signaled after with 400Mbps reserved. Which paths will CSPF choose for LSP-3 and LSP-4? Both LSP-3 and LSP-4 take R1-R2-R4-R6. CSPF randomly chooses one of the equal cost paths for the two LSPs. LSP-3 takes R1-R2-R4-R6 and LSP-4 takes R1-R3-R5-R6. Both LSP-3 and LSP-4 take R1-R3-R5-R6. LSP-3 takes R1-R3-R5-R6 and LSP-4 takes R1-R2-R4-R6. R6. 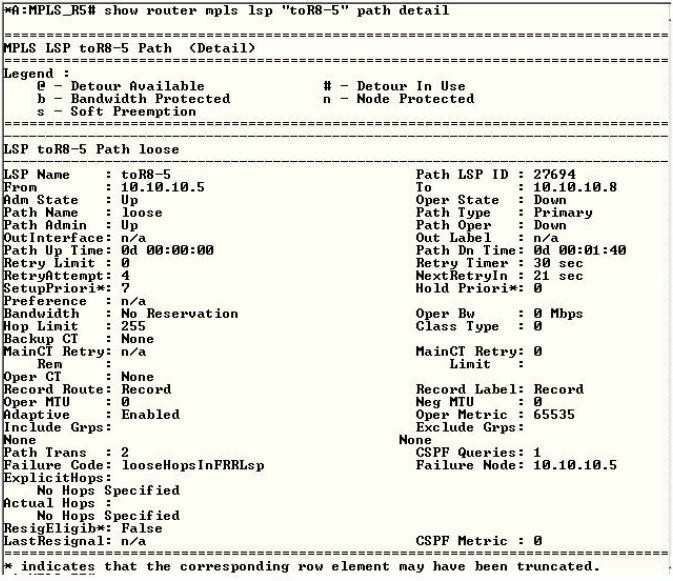 By default, which of the following about this LSP on an Alcatel-Lucent 7750 SR is FALSE? The LSP will switch to R1-R3-R5-R6 after the resignal timer expires. The traffic is switched to R1-R3-R5-R6 in an MBB fashion. The old primary path and its detours are torn down after the new primary path is established. CSPF must be enabled to find a more optimal path. Which of the following about an LSP protected with facility FRR is TRUE? The LSP can use protection tunnels used by other LSPs. A detour protection tunnel is created for this LSP. The LSP can use facility and one-to-one FRR simultaneously. The LSP is limited to link protection. down, which of the following is the quickest way for service recovery? Router R1 updates its FIB after a new SPF calculation. Router R4 switches to a standby secondary path. Router R1 switches to a secondary path. 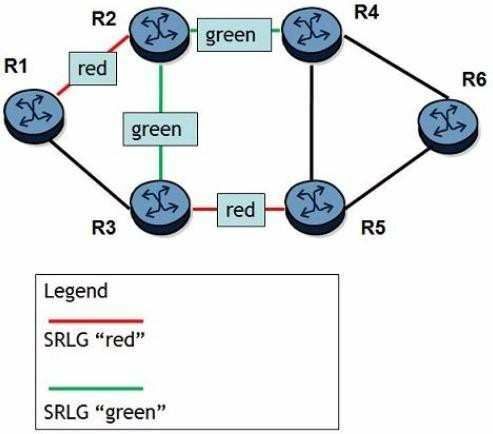 Router R4 switches to a FRR path. 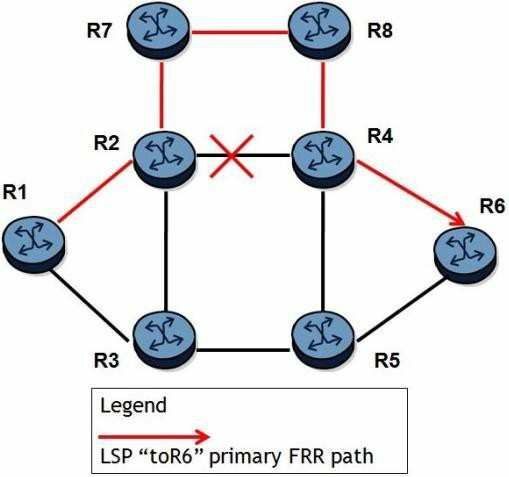 LSP " to R8-5 " requests fast reroute protection. What could be done to remove the Failure Code shown? The LSP must be enabled with CSPF on the head-end router. CSPF and fast reroute must be enabled on all downstream routers. Fast reroute must be enabled on the downstream routers. A mixture of strict and loose hops must be defined in the primary path. 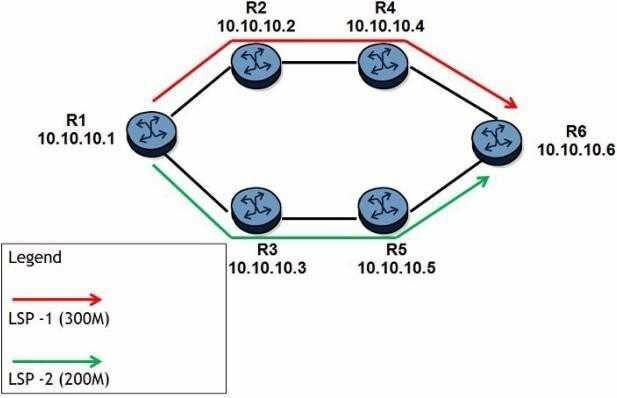 Which of the following about Fast Reroute node protection tunnels is FALSE? Node protection tunnels detour around a failed next downstream router. Link protection tunnels are established if a router is unable to establish node protection tunnels. Node protection tunnels can only be requested for a primary LSP path. Node protection tunnels are only used by one-to-one Fast Reroute. Which of the following about the use of RRO in fast reroute is FALSE? RRO is used to report the protection tunnel status to the head-end router. RRO is used to inform downstream routers about the protection type requested. 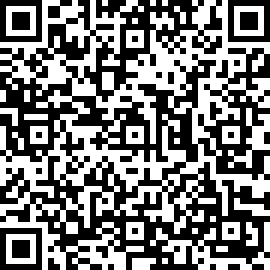 RRO contains the MP information that is required by a PLR for facility protection. RRO contains the label information that is expected by an MP for facility protection. are of equal cost. Which path will the secondary path take? The secondary path will take R1-R3-R2-R4-R6. The secondary path will take R1-R3-R2-R4-R5-R6. The secondary path will take R1-R2-R4-R6. The secondary path will take R1-R2-R3-R5-R6. protection. 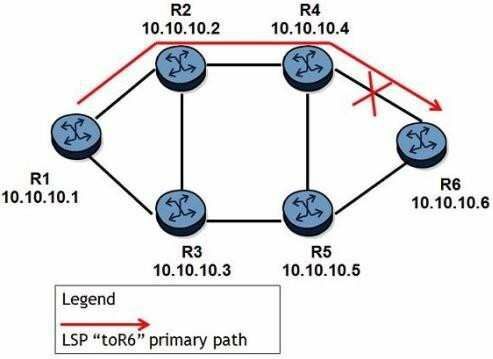 When router R1 is the PLR, which router becomes the Merge Point (MP) for this LSP? Which of the following is NOT a characteristic of MPLS? It provides the ability to establish connection oriented paths over a connectionless IP network. It can use GRE tunnels to transport data from many different protocols over an IP network. It provides a mechanism to engineer network traffic patterns independently of IP routing tables. It will work over most physical layer protocols. Which of the following regarding per-platform label space is TRUE? A separate label is used for each interface on which the FEC is advertised. It uses more label resources than a per-interface label space. It is typically used when the device has ATM or Frame Relay interfaces. Which of the following is TRUE when the explicit null is implemented? The penultimate router will forward packets to the eLER, based on the IP header. The penultimate router will pop the top label from the packets. The eLER will receive packets with a top label value of 0. The eLER will receive packets with a top label value of 3.
field (EXP bits) is TRUE? The TC field is set based on the value of the DSCP field inside the customer packet. The TC field is set by the eLER. The TC field is set to a specific value via explicit administrative configuration. The TC field is set to a system generated random number. mapping for the FEC's next-hop? Which of the following best describes downstream on demand label distribution? An LSR advertises label mappings to all peers for which it might be a next-hop for a given FEC. An LSR distributes a label mapping for a FEC when it has been requested to do so. Which of the following regarding MPLS label value assignment is FALSE? Label values may be dynamically assigned by LDP. Label values may be dynamically assigned by IGP. Label values may be dynamically assigned by RSVP-TE. Label values may be reserved for special uses. Which of the following is a characteristic of LDP Hello messages? They are multicast to the All Hosts address. They are broadcast or multicast, depending on the physical media. They are broadcast to the subnet broadcast address. They are multicast to the All Routers address.